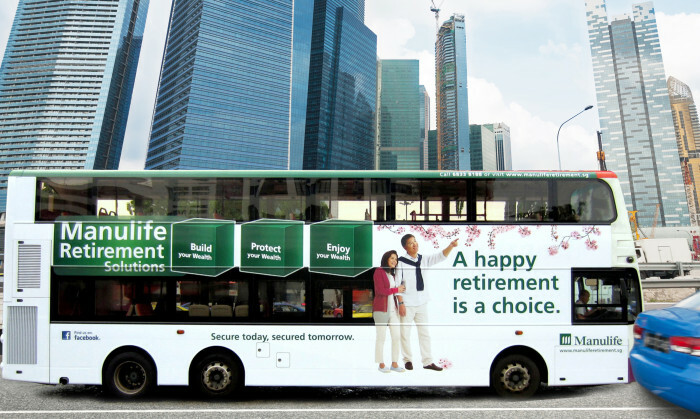 Manulife Singapore has launched an integrated campaign to highlight the benefit of a planned retirement. Urging Singaporeans to make a smart choice earlier on in life the “Happy Retirement” campaign aims to connect with Singaporeans who aspire to live a carefree lifestyle during retirement. It features a couple enjoying their holidays and contrasts this with an image of an unplanned retirement to instil a sense of urgency to plan ahead. It highlights that a Singaporean should take ownership to make his/her retirement a happy one. The campaign, launched in early May, shows how one can take control to achieve his/her retirement dreams with Manulife Retirement Solutions using a three-pronged approach of building, protecting and enjoying your wealth. “The average Singaporean now lives to 85* years and about half will live considerably longer. Hence, there is the risk of Singaporeans outliving their savings. Manulife is here to help Singaporeans with their retirement planning,” Annette King, president and CEO, Manulife Singapore, said. Here is an animated video to illustrate this three-pronged approach. In addition, the Manulife Retirement microsite has been refreshed to provide resources for retirement planning and a self-help tool to calculate any retirement gap. The new Manulife advertisements can also be found on 10 buses that shuttle the CBD area, as well as in the heartlands, on taxis, static posters and in animated videos at select bus stops. Also running are print advertorials providing financial tips with real life examples on digital platforms such as Yahoo!, AsiaOne, Channel NewsAsia and on mobile applications and networks. The island-wide campaign retains the key message – “Secure today, secured tomorrow” with Manulife Retirement Solutions. The campaign also injects a fun element, the “Embracing Longer Retirement” contest on the Manulife Singapore Facebook page where fans can share an inspirational story or their fondest memory of the oldest person they know/knew. The three most inspirational stories will win a family studio photo-shoot worth SG$600. And another four fans stand to win SG$100 worth of shopping vouchers in a lucky draw. “This new campaign builds on the success of last year’s “Never Lose Sight Of Your Retirement” campaign and leverages consumer insights from our focus group studies,” Hitesh Shah, chief marketing officer, Manulife Singapore, said. *Source: Singapore Department of Statistics, Life Expectancy at Age 65 in 2012. Hong Kong marketing and design agency MADE has opened an office in London to tap into a growing number of UK firms looking to brea..